What is a Qorus Hub? A Qorus Hub is an instance of Qorus. You can think of it as a Qorus account, where all your settings, subscription information, users, and content source connections are saved. When you sign up for Qorus, we automatically create your Qorus Hub. Then after you’ve signed up, you can create additional Qorus Hubs for your organization, and switch between them in the Qorus Add-ins or in the Qorus Hub Central. This is ideal for business units, departments, or teams who each wish to manage their own Qorus Hubs independently, but still allow for collaboration across Qorus Hubs when needed. NB: Please note that pricing is per user, per Qorus Hub. Guests are free however, so you could for instance belong to one Qorus Hub as a fully licensed user, and then be a guest on another Qorus Hub for the purposes of collaborating. In that case, you would only need to pay for a user license on the Qorus Hub where you are fully licensed user. A content source is a place where your content lives, and that you have connected to Qorus. In other words, it’s a place where you can locate or ‘source’ appropriate content, for the purposes of either re-using that content in documents, emails, and presentations, or as a basis for creating new documents and presentations (templates). When you sign up for Qorus, we automatically connect OneDrive for Business for you. This is your first content source. After that, you can connect other sources of content from SharePoint Online (SPO) to Qorus. For instance, you could create a ‘Marketing Team’ content source that connects to multiple libraries in SPO that each contain marketing collateral. Or you could connect an SPO list and create an ‘FAQ’ content source. To see all the content sources connected to your Qorus Hub, click on 'Search' in the top nav in any of your Qorus Add-ins. To learn how to connect your content to Qorus, please click here. What is the difference between a Search Location and a Save Location? When you create a content source, you can specify the places within that content source you'd like to make searchable. These are known as search locations. Search locations can be SharePoint Online (SPO) libraries, library folders, lists, or OneDrive for Business. You can also specify the places within that content source you'd like to allow users to clip and save new re-usable documents to. These are known as save locations. Save locations can be SPO libraries, library folders, or OneDrive for Business. To learn how to use the Qorus search to locate your best content while you work in Word, Outlook or PowerPoint, please click here. To learn more about how to grow your re-usable with the Qorus Clip and save useful content to SharePoint for future re-use, please click here. If you’ve signed up for a Qorus Hub, you are automatically assigned to the Admin user role. The Admin user role carries the highest level of permissions and has access to all Qorus features, across all of Qorus. There are no limits to the number of Admin users you can have. 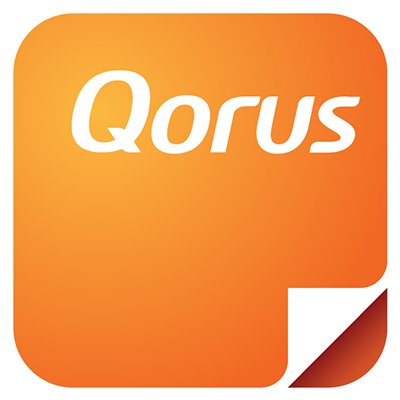 The Designer user role has access to all the features available within the Qorus Add-ins for Office 365, but does not have the ability to configure and manage Qorus Hubs. Users that belong to the Designer user role are usually power users who create and manage smart content and templates used by the rest of the organization. Like the Designer role, the Standard role has access to all the features available within the Qorus Add-ins but does not see the 'Design' pane and cannot create or manage smart content. Standard users also don't have the ability to configure or manage Qorus Hubs. Then the last user role to know about if you’re on Qorus Premium, is the Guest user role. Guest users can only make use of the Qorus Add-in for Word for the purposes of collaborating. They can receive and complete assignments, and have up to a maximum of 5 concurrent assignments active at any one time.